Fig. 16-6. Reduced Elevation Residual Versus Time Modulo Period of $ for a Nutating Spacecraft With 0-&58 Deg. See text for explanation. phase of the plot and the azimuth, a, of any star sighting. For example, if the circled observation at a phase of approximately +90 deg occurs at 52.3 sec (modulo the period of </>) and is for a star whose azimuth in the L system is 175.25 deg, then <f>os»90"-$f+a«i 16.83°. In this subsection, we consider the problem of determining the amplitude and phase of nutation from a Sun sensor which observes the Sun approximately once per spin period. We assume that both die Sun angle and Sun sighting time are monitored by a sensor, such as the digital Sun sensor described in Section 6.1.3, whose field of view is a slit parallel to the z principal axis and perpendicular to the nominal spin plane. As illustrated in Fig. 16-5, nutation produces an oscillation in both the Sun angle and the measured spin period determined from the Sun sighting times. 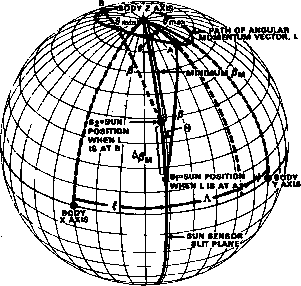 We wish to relate this oscillation to the nutation angle, 9, and the azimuthal orientation, of the angular momentum vector, L, in spacecraft coordinates. both vectors are fixed in inertial space. Therefore, as L oscillates about z, the position of the Sun at the time of a Sim angle measurement moves up and down the sensor slit plane so that fi remains constant. In Fig. 16-7, when L is at A, then S is at S, and the measured Sun angle, is a maximum; when L is at B, S is at S2 and is a minimum. * The amplitude, A/}m, of the measured Sim angle variation will be between 20^ and 20„^ depending on the orientation of the sensor slit plane relative to the principal ax«. When the Sun sensor slit plane is the y—z plane, APm=20imu (assuming Sun sightings actually occur when 9=0maJ. When the slit plane is the x — z plane, A/Jm will be a minimum. In most practical cases, this minimum value is approximately 20^. However, as shown in Fig. 16-8, when lx<-ly and the Sun angle is sufficiently small, then the path of the angular momentum vector will be very elongated and A/Jm will be greater than 2 O^ when the slit plane is the x — z plane. 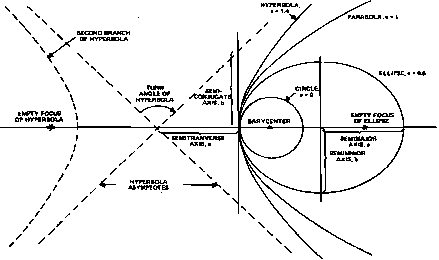 For Sun angles less than 90 deg, as shown in Fig. 16-8, the maximum value of fim is f}+0^ when L is at D. However, when the maximum radius of curvature of the nutation curve is greater than j8, then the minimum will be /8-0^-t and will occur at two symmetrically located points, A and B, on the nutation curve. For Sun angles greater than 90 deg, we may use Fig. 16-8, measuring j8 from the — z axis. Thus, pm will oscillate between P+'O^ + t and fi-O^. Note that the elevation of the Sun in the spacecraft frame oscillates at the inertial nutation rate, <j>, as shown in Eq. (16-106). However, from Fig. 16-8, it is clear that the measured Sun angles depend on the orientation of L in the body; hence, they should oscillate at the same rate as L in the body, as will be proved later. •Sun sighting occur at discrete points along the path of L However, for the geometrical arguments of Figs. 16-7 and 16-8, we assume that Sun sightings will occur for each of the possible positions of L.